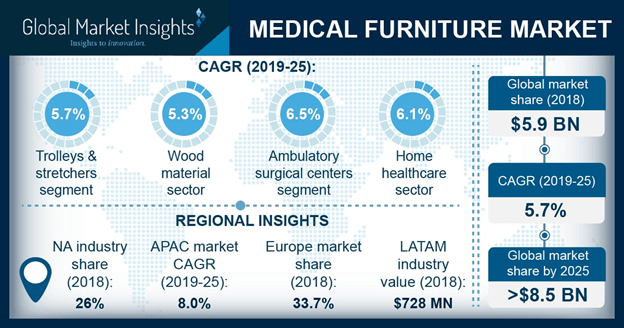 Medical Furniture Market size is set to exceed USD 8.5 billion by 2025; according to a new research report by Global Market Insights. Increasing number of hospital admissions is forecasted to boost the medical furniture market growth during the analysis period. Growing number of hospital admission is associated with the rising prevalence of chronic diseases and orthopedic disorders requiring surgical procedures. Surgical procedures increase length of stay of patients in hospitals that significantly impacts industry growth. Improvement in hospital infrastructure has raised the number of hospital admissions thereby, positively impacting the demand of medical furniture. Favorable regulations enforced on the key industry players operational in medical furniture market has propelled the industry growth in forthcoming years. Companies such as Stryker, Invacare and GE Healthcare focus on introducing innovations in the beds and other medical furniture required in hospitals and ASCs. Recently developed beds are automated and significantly reduce human labor. For instance, in 2015, Invacare launched superior quality adaptive medical furniture including electric long-term acute beds. Therefore, availability of innovative medical furniture developed by major players augments the industry growth. However, high cost of medical furniture may hamper industry growth to some extent.